Social groups for older ex-service veterans are being set in Nottinghamshire to reduce loneliness and social isolation, and help improve their health and wellbeing. It is estimated 5.8 percent of Nottinghamshire’s 750,000 population are ex-service community, which amounts to 43,500 residents. The County Council was awarded £106,000 to fund a project worker for two years to link up veterans aged over 65 with local projects and activities to help them be more active in their community. Weekly group sessions have started at Broxtowe Day Service based on Sunnyside Road and are held every Tuesday between 10.30am and 12pm. Activities include cooking, reminiscence sessions where attendees share wartime and past experiences, and creating a war memories archive. 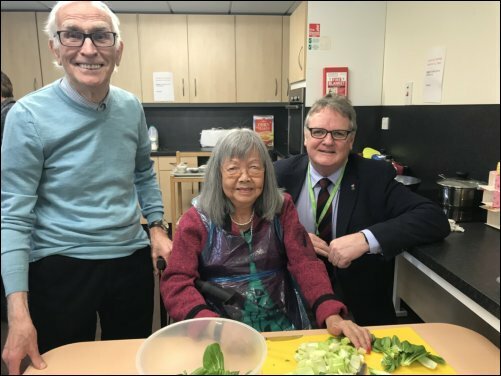 The sessions are part of a wider project with the St John and Red Cross Defence Medical Welfare Service (DMWS) who have two welfare officers based in the QMC and City Hospitals to offer impartial and confidential medical welfare advice to veterans aged 65 and over. The DMWS and the Alzheimer’s Society teamed up with the Council to win the funding from the Community Covenant Aged Veterans Fund, which amounts to £400,000 for Nottinghamshire.